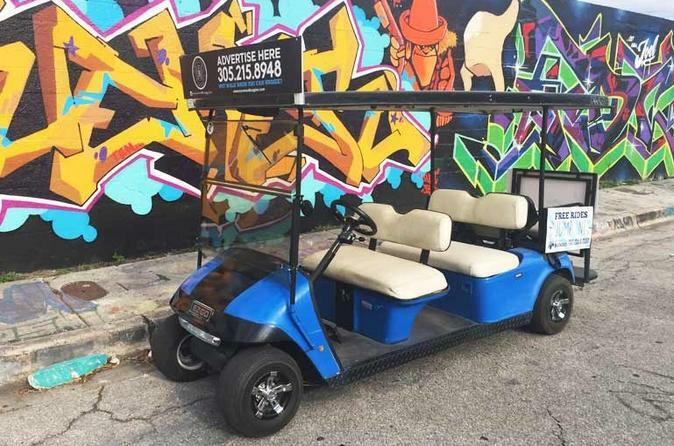 Beat the heat and discover the art of Wynwood on this relaxing, entertaining, and educational 1-hour, covered golf cart tour. With the driver/guide leading the way for this small group, travel from one location to the next in search of the best displays in the neighborhood. See and take pictures of the amazing street art and murals on the buildings. Discover the works of Shepard Fairey, Retna, D*Face, and Aec Interesni Kazki, to name a few. Pick the most desired time to ride around Wynwood — 11am, 12:15pm, 1:30pm, 3pm, or 5:15pm. Then meet and greet the professional guide (and golf cart driver) at Wynwood Art Walk. Find a seat on the golf cart with the rest of the small group and head down the streets to begin this 1-hour tour. Without taking a step, go sightseeing through the streets of Wynwood. See dozens of murals in the Arts District, with works by world-renowned artists like Shepard Fairey, Retna, D*Face, and Interesni Kazki, to name a few. Explore the underground graffiti world, as well, by local artists. Also, learn where the best restaurants, breweries, and art galleries are located. *Specific artwork and murals are subject to change.